For this week’s Treasure Chest Thursday, I’m looking at two clippings from the Donna Darling Collection concerning earthquakes. The earthquake was significant enough for Donna to clip newspaper articles about the experience. As New Yorkers, I’m sure an earthquake was scary for them. 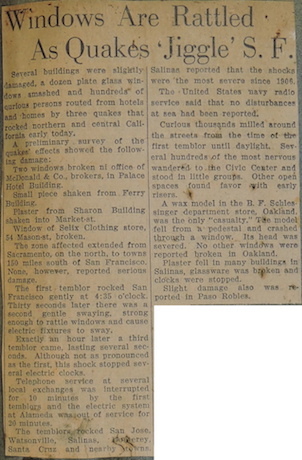 Although the clippings aren’t dated, it is clear that they refer to the October 22, 1926 earthquake off the coast at Monterey[i]. We still don’t know where she and Sammy were on October 21st or 22nd, however, we know they played in San Jose on October 23rd through the 25th. San Jose is about 50 miles to the north of Monterey. We also know they played in Southern California earlier in the month and were working their way north. It is very possible they were actually in Monterey during the earthquake. Windows Are Rattled As Quakes ‘Jiggle’ S. F.
Several buildings were slightly-damaged, a dozen plate glass-windows smashed and hundreds of curious persons routed from hotels and homes by three quakes that rocked northern and central California early today. A preliminary survey of the quakes’ effects showed the following damage: Two windows broken in office of McDonald & Co., brokers, in Palace Hotel Building. Small piece shaken from Ferry Building. Plaster from Sharon Building shaken into Market-st. Window of Selix Clothing store, 54 Mason-st, broken. The zone affected extended from Sacramento, on the north, to towns 150 miles south of San Francisco. None, however, reported serious damage. The first temblor rocked San Francisco gently at 4:35 o’clock. Thirty seconds later there was a second gentle swaying, strong enough to rattle windows and cause electric fixtures to sway. Exactly ‘an hour later a third temblor came, lasting several seconds. Although not as pronounced as the first, this shock stopped several electric clocks. Telephone service at several local exchanges was interrupted for 10 minutes by the first temblor and the electric system at Alameda was out of service for 20 minutes. The temblors rocked San Jose, Watsonville, Salinas, Monterey, Santa Cruz and nearby towns. Salinas reported that the shocks were the most severe since 1906. The United States navy radio service said that no disturbances I at sea had been reported. Curious thousands milled around I the streets from the time of the first temblor until daylight. Several hundreds of the most nervous wandered to the Civic Center and stood in little groups. Other open spaces found favor with early risers. A wax model in the B. F. Schlesinger department store, Oakland, was the only “casualty.” The model fell from a pedestal and crashed through a window. Its head was i severed. No other windows were reported broken in Oakland. Plaster fell in many buildings in Salinas, glassware was broken and clocks were stopped. Slight damage also was reported in Paso Robles. Three distinct earthquake shocks were felt in San Francisco and Central California today. The first was at 4:36 a. m., the second at 5:36 and the third at 6:42 a. m. The second was the most severe. Damage in San Francisco and the entire affected district was negligible, being confined to broken windows, falling plaster and a few minor cracks in buildings. The ‘‘shocks were felt as far north as Napa and south to San Luis Obispo, with varying intensity. San Jose, Oakland, Berkeley, Alameda, Palo Alto, San Mateo and Monterey reported no damage except a few cracked ceilings and windows. Electric light service in the Eastbay was affected for a time. The center of the shocks appeared to be between San Francisco and Monterey according to the Associated Press. They were o£ a northerly and southerly movement, along the old fault line of the 1906 quake. Although quite minor in nature, I’m sure Donna and Sammy quickly exited their hotel and hoped it wouldn’t be another “big one.” The disaster of the 1906 earthquake was only 20 years earlier and a fresh memory for many in the Bay area. I remember the concern I had when I lived in San Diego and experienced my first earthquake. Although minor, such an experience can be very unsettling for those of us from areas of the country where the ground stays put. I can imagine what went through Donna and Sammy’s minds in the early morning of 22 October 1926.